SEOUL - North Korean leader Kim Jong Un vowed Wednesday his nation will “demonstrate its mettle to the U.S.” and never put its weapons programs up for negotiations, a day after successfully testing its first intercontinental ballistic missile. The hard line suggests that North Korea will conduct more weapons tests until it perfects nuclear-armed missiles capable of striking anywhere in the United States. Analysts say Kim’s government believes nuclear weapons are key to its survival and could be used to wrest concessions from the United States. Tuesday’s ICBM launch, confirmed by U.S. and South Korean officials, was a milestone in North Korea’s efforts to develop long-range nuclear-armed missiles. But the North isn’t there yet, and many analysts say it needs more tests to perfect such an arsenal. South Korea President Moon Jae-in said Wednesday that the world should look at tougher sanctions against the North and insisted the problem must be solved peacefully. Worry also spread in Washington and at the United Nations, where the United States, Japan and South Korea requested an emergency U.N. Security Council session Wednesday. U.S. Secretary of State Rex Tillerson said the U.S. response would include “stronger measures to hold the DPRK accountable,” using the acronym for the nation’s formal name, the Democratic People’s Republic of Korea. In a show of force, U.S. and South Korean troops fired “deep strike” precision missiles off South Korea’s east coast Wednesday. South Korea’s military later released previously shot video showing the test-firing of sophisticated South Korean missiles and a computer-generated image depicting a North Korean flag in flames with the backdrop of a major building in Pyongyang. North Korean state media described leader Kim as “feasting his eyes” on the ICBM, which was said to be capable of carrying a large nuclear warhead, before its launch. “With a broad smile on his face,” Kim urged his scientists to “frequently send big and small ‘gift packages’ to the Yankees,” it said, an apparent reference to continuing the stream of nuclear and missile tests Kim has ordered since taking power in late 2011. 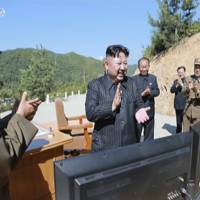 North Korea was also pleased that its test came as Americans celebrated Independence Day. 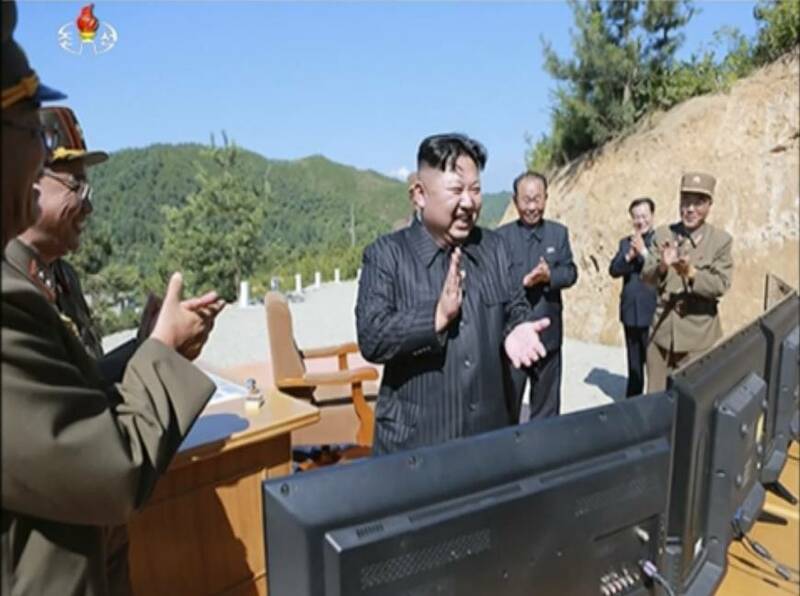 State media said Kim told “scientists and technicians that the U.S. would be displeased to witness the DPRK’s strategic option” on its Independence Day. Kim also said North Korea “would neither put its nukes and ballistic rockets on the table of negotiations in any case nor flinch even an inch from the road of bolstering the nuclear force chosen by itself unless the U.S. hostile policy and nuclear threat to the DPRK are definitely terminated,” the Korean Central News Agency reported. The missile launch was a direct rebuke to U.S. President Donald Trump’s earlier declaration on Twitter that such a test “won’t happen!” and to Moon, who was pushing to improve strained ties with the North. South Korea’s Defense Ministry said it was unable to verify whether North Korea has mastered re-entry technology for an ICBM. It said North Korea may now conduct a nuclear test with “boosted explosive power” to show off a warhead to be mounted on a missile. The U.N. Security Council could impose additional sanctions on North Korea, but it’s not clear they would stop it from pursuing its nuclear and missile programs since the country is already under multiple rounds of U.N. sanctions for its previous weapon tests. There is a consensus among many analysts that Kim’s government won’t give up its nuclear program because it believes it guarantees its survival from outside threats. But once it possesses functioning ICBMs, it would also have a stronger bargaining position and might propose talks with the United States on reducing those threats, possibly in exchange for freezing but not dismantling some of its nuclear or missile activities, the analysts say. North Korea might seek a downsizing or suspension of joint U.S.-South Korean military exercises that it views as rehearsals for an invasion, or the signing of a peace treaty officially ending the 1950-53 Korean War that could be used as a pretext for demanding the withdrawal of the 28,500 American troops currently in South Korea. The war ended with an armistice, not a peace treaty, leaving the Korean Peninsula technically still in a state of war. “If the U.S. doesn’t accept talks, North Korea might stage provocations or take other dangerous actions to draw the U.S. into negotiations,” said analyst Park Hyeong-jung at South Korea’s Korea Institute for National Unification. If the United States were to hold talks with a North Korea capable of attacking the entire U.S. mainland with nuclear weapons, those negotiations would be like “arms reduction talks,” Lim said. North Korea already has a reliable arsenal of shorter-range missiles and is thought to have a small number of atomic bombs. Some outside civilian experts believe the North has the technology to mount warheads on shorter-range Rodong and Scud missiles that can strike South Korea and Japan, two key U.S. allies where about 80,000 American troops are stationed. But it’s unclear if it has mastered the technology needed to build an atomic bomb that can fit on a long-range missile. Regional disarmament talks on North Korea’s nuclear program have been stalled since 2009.